The Dogs went in to the weekend knowing only two wins against their arch rivals the Hull Pirates would be good enough. Hull started the weekend a point ahead knowing winning either game would secure the title for Jason Hewitt’s team. Saturday’s game was a war of attrition with neither side wanting to make a mistake that would give away an advantage. Hull fans had travelled in numbers but the Steeldogs took energy from playing in front of the biggest attendance in the club’s history - the game at iceSheffield was a sellout. 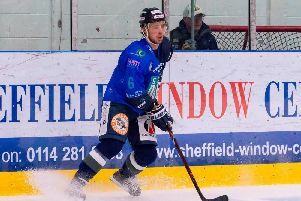 In such a close match, staying out of the penalty box was important and the Steeldogs seized the advantage on a power play with James Spurr burying a rebound from a Milan Kolena blast at 11:47. No one would have guessed that would be the only goal of the game, especially in the 2nd and 3rd period where Hull dominated possession and scoring opportunities. However some committed defending and more brilliance from net minder Dmitri Zimozdra secured a 1-0 win. Sunday night in Hull was a completely different game. The Dogs jumped out to a 2-0 lead in 12 minutes with goals from Ashley Calvert and Lloyd Gibson. Any thoughts of a comfortable win quickly disappeared as Hull ended the period on level terms. Sheffield came out strongly with Calvert and Kolena strikes putting them 4-2 up by 25:04. A pair from Jason Hewitt tied it up only for a great skate and shoot from Liam Charnock that put the Dogs back in front again. With Hull laying siege on Zimozdra’s net, it was their coach who would be involved in the decisive moment of the game with Hewitt given a match penalty for abuse of an official. Adrian Palak scored during the 5 minute power play and despite a final assault from Hull, the Steeldogs hung on to secure an unlikely second win of the weekend and the Moralee Conference Championship. The team must limit the celebrations of their first major trophy as the playoffs begin this coming weekend. Billingham Stars will be the Steeldogs quarter final opponents with fixture details to be confirmed soon.